About 250 high school and college students from across Georgia will gather Feb. 22 on the campus of the state’s public medical school to learn more about successfully pursuing a medical education. Participants in the one-day program, Igniting the Dream of Medicine, will do mock interviews with members of the Admissions Committee of the Medical College of Georgia at Georgia Regents University, work in interactive labs learning basic skills such as suturing, and get an up-close look at human organs. They’ll also get tips from MCG students and faculty on goal setting and contingency planning; get candid professional tips from students and residents; and learn more about the Medical College Admission Test. Students from groups underrepresented in medicine are a focus of the program, which is co-sponsored by the MCG Chapter of the Student National Medical Association and the MCG Office of Student and Multicultural Affairs. The low $15 registration enables broad participation. “There are a lot of students out there who would like to go to medical school but really don’t have any mentors, they don’t know anybody who has gone, they don’t have anybody they can reach out to and get advice from,” said LaShon Sturgis, an MCG senior who started the program three years ago while President of the MCG Chapter of SNMA, which works to diversify the medical field. “That is why we named it ‘Igniting the Dream of Medicine,’ so we can let them know we did it, you can do it, too, and we are here to help you,” LaShon said. “I think it would have been a real eye-opener for me to know what I should have done at certain stages during my school years,” says Kojo Dadzie, MCG sophomore and President of the MCG SNMA. A native of Ghana, he considers himself fortunate, and not without help, in getting to medical school, citing his five older brothers’ model of hard work along with learning from their mistakes in their own fields. After acceptance into MCG, Kojo also participated in a pre-matriculation program at the medical school to further prepare him for the rigors ahead. Igniting the Dream of Medicine expands the reach of MCG’s 40-year-old pipeline initiatives, which include the pre-matriculation and the Student Educational Enrichment Program, a free seven-week summer premed experience for high school and college students, said Dr. Kimberly Halbur, Associate Dean of Student and Multicultural Affairs. “It’s wonderful that it’s student-driven but I think it’s also been neat from our perspective as administrators and faculty members that it totally meets the mission of what we do and what we are trying to accomplish,” Halbur said. Numerous undergraduate groups across Georgia, such as premed groups and biology clubs, use fundraising dollars to sponsor the Saturday trip for young people, said Linda James, MCG Director of Diversity Outreach and a SNMA advisor. James spends about half the year traveling the state, talking with students, guidance counselors, and advisors, and believes those advisors will benefit as well from this first-hand experience on what students need to be competitive. The advisor experience will include a private session with Dr. Saundra Herndon Oyewole, a member of the Association of American Medical Colleges Advisory Group that is evaluating the new MCAT. Enriching advisors significantly multiplies the student impact, agree Halbur and James. 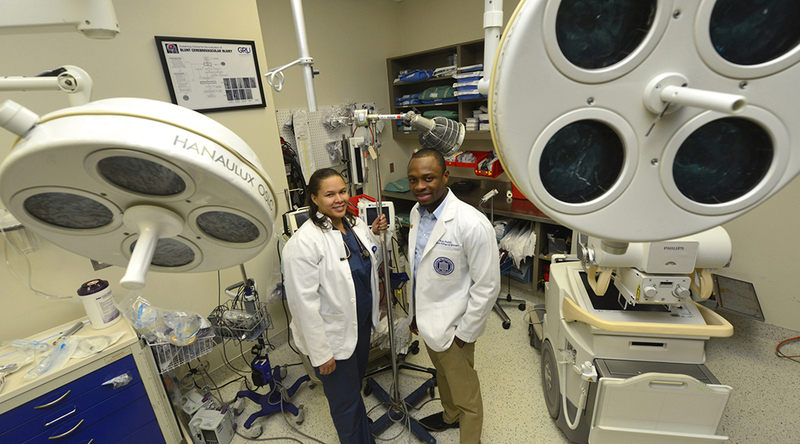 Kojo and LaShon hope the net effect will be diversifying Georgia’s health professions workforce. “Hopefully someone can use me as an inspiration for whatever goal he or she is trying to achieve,” said Kojo. “I want students walking away saying, “I see someone who did it who looks like me and I can do it, too,’” added LaShon. For more information, visit: http://www.gru.edu/mcg/students/ignitingthedream.php.